Two of Our Toronto Devotees Caring for Cows ~ The Toronto Hare Krishna Temple! 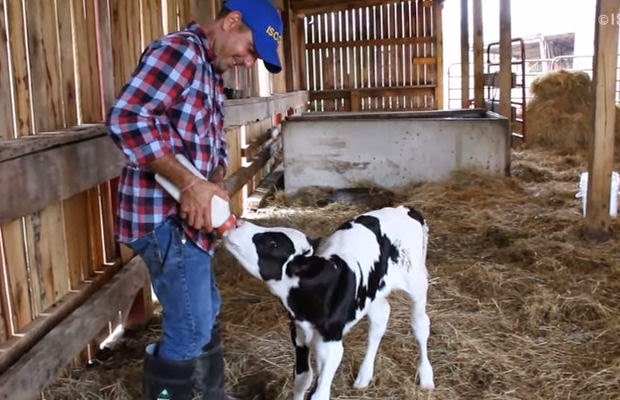 A few weeks ago, two of our young devotees from our Toronto community, Fil and Sukhayanti, moved to West Virginia where, close to New Vrindaban, there is a wonderful farm run by the International Society for Cow Protection (ISCOWP). The main coordinator of the farm Balabhadra prabhu and he is currently training both Fil and Sukhayanti about farming and cow protection. Check out this inspiring video showing all the devotees in action as they greet some new calves to the farm! The best! Haribol to their compassion. Hare Krishna. Very nice: Lord Krsna & Smt Radharani are very happy !! Amazing...like a dream..but coming true! all glories to the devotees who made this happen. Thank you so much for posting this video and a big thanks to the whole Toronto Yatra for your support. We are blessed to be doing this service. We look forward to bringing the knowledge that we are acquiring back with us to Ontario to establish cow protection and agriculture, Krishna willing.